Well yesterday Saturday 12th May saw the first Sporadic-E opening on 2mtrs, (as far as I am aware) for 2007 season. The reflective area, or cloud, as some like to call it, was located over Italy, and was basically too far away from my location to bend any signals to the UK. it could all change and the band could open up to my area. 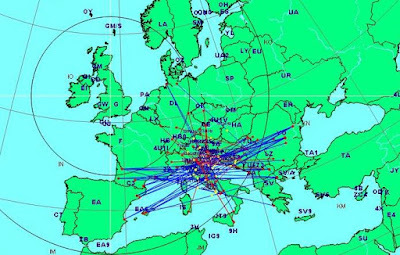 Below is a picture showing the areas who managed to contact each other.